Not few of people who are looking for second hand house for residing because new house is really high value currently. However, good points of second house are not less than new house. In addition, we can use second house to invest or buy it to renovate according to buyer preference. How to purchase worthy second hand house? We have to check detail of house thoroughly. There are important things that we should check as follows. Let’s see details that people who are interested in second hand house. What are these details? People who will buy or people who are interested in second hand house have to look at buildings that was built on land, check number of title deed and check house number because constructions were built on wrong land frequently. In addition, in case that house was built on lease land buyer needs to check to make sure whether there is lease agreement or not. Buyer also needs to check how many years of lease agreement, period of lease agreement and conditions. Buy have to make sure in case that if there is problem about buildings that was built on other land, buildings owner will be surely adverse because any juristic act has to get consent of land owner first. Buyer needs to measure size of utility space of each buildings by measuring of width and length (meter) for calculating into square meter. Information of size is important and necessary for estimating price of buildings. Therefore, when buyer check second hand house every time needs to carry tape measure. The lengths of tape measure are from 20-50 meters. It use for measuring size of every floors and combine them to be total spaces of whole buildings. Normally state of second hand house depends on age of buildings and preservation. Each second hand house has different state abundantly. Depreciation and compensation for use are high or low differently. Primary criterion that people use for estimate depreciation or compensation for use of second hand house mostly depends on reference duration to use of each house importantly. For example, if there is 50 years old house, people will calculate depreciation 2% per year. If the house is 20 years old, it is going to be 5% etc. Another popular method is calling technician to estimate repair fee to make house has better state than before. Technician can estimate total expense and then repair fee can deduct to be depreciation later. All of above topics are other important factors that involve with value of second hand house. Moreover, buyer has to check main structures of buildings for instance wood or concrete with supporting steel etc. When buyer gets detail already and then has to check detail. After that, buyer has to check details of interior decoration which are material, quality of material and skill of technician. Value estimation of buildings normally involves with decision to select estimation price per square meter. The prices are low, medium or high. Buyer can select which price is proper. Buyer has to check ownership of construction that it belongs to land owner or not. Buyer can request to see evidences of getting ownership of construction from sale and purchase evidences. In case of new construction, buyer can request to see application for construction, because government officer regards as a person who owns application for construction is that tenement or buildings. Buyer can request to see application for house code number because request house code number proprietor is an only one person who has authority. 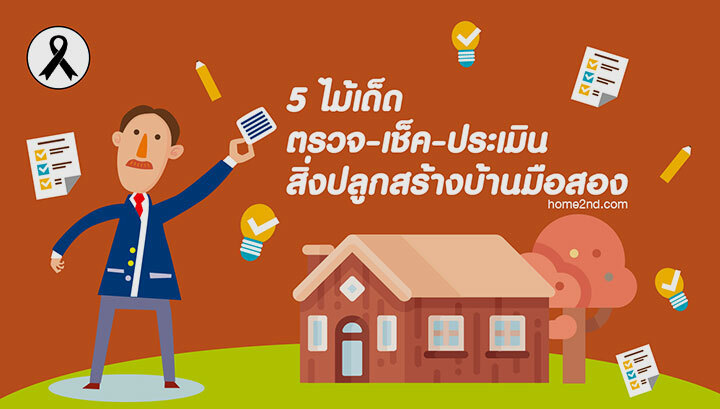 Thank you for knowledge source: House sale and purchase for investment (Teacher AnuchaKunwisut ) andHome2nd.com Page.